For the second consecutive year, the SitePoint Podcast will host a special live show at WordCamp Raleigh in Raleigh, North Carolina. Last year’s show, the first ever live, in person episode of the podcast, was a big success, with a face to face audience of 80-120 people and a live online audience in the hundreds. So, we’re doing it again! 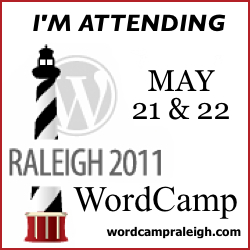 WordCamp Raleigh will be held at the Sheraton Raleigh on May 21 and 22. It is a conference focused on WordPress, the popular publishing platform that powers SitePoint Blogs, with presentations covering not only WordPress, but related topics, as well. You can register for the conference online, with tickets available for just $45. The podcast will be live on May 21 for two hours, starting at 1 PM ET (GMT/UTC -4) in the room dedicated to the Users Track. We’ll have prizes, special guests and a lot of fun and conversation. You will need a conference pass to attend the podcast in person. Just like last year, it’ll be my co-hosts Brad Williams (@williamsba) and Stephan Segraves (@ssegraves) alongside myself (@ifroggy). Unfortunately, our newly anointed co-host Louis Simoneau (@rssaddict) will not be making the long trek from Australia. Dave Moyer will be helping us out again on the technical end. We will be bringing up two members of our in-person audience to appear as special guests on the podcast and we’ll interview them live on the show.Â If you attend, it could be you. Selected live from our in-person attendees at WordCamp Raleigh! The show will be broadcast online, so if you can’t make it in person, we encourage you to join us live here on the podcast homepage. We will be recording the show so that it can be released as a regular podcast, but we hope to have you there with us for the fun, whether for the whole show or just part of it. If any podcast listeners are in the area and can make it to the event, we’d love to meet you in person! Please let us know in the comments. Thank you for reading and we hope to see you there.